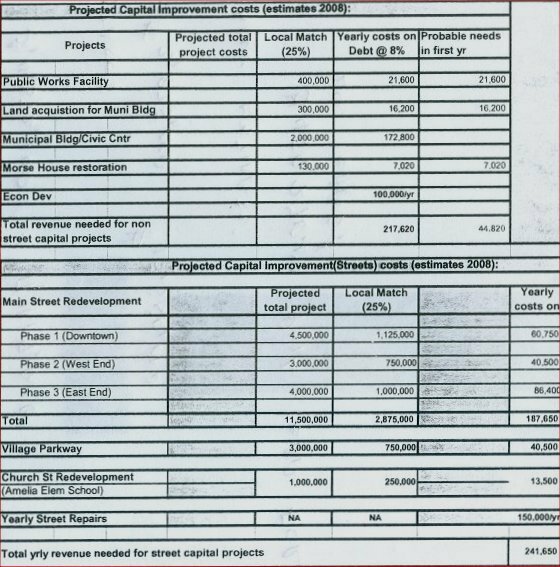 Below you will find a copy of the projected capital improvements budget from 2008. What it clearly illustrates the amount of debt they plan to impose on you in the future. I have done a little arithmetic for you and I believe it amounts to $459,270.00 per year. I have been told that it is for 20 years. That would amount to $9,185,400.00. You can go to the Village website and dig this out if you want to but this is the budget. So another $459,270.00 a year for the next 20 years. I think we now know the truth about why they want an income tax. I would also like to point out that I believe the Planning Commission is also involved so they have to get some blame also. PLEASE LISTEN: If this plan goes through the heart of Amelia will all but be destroyed. I think the plan calls for 14 houses to be taken. I will verify this as I get time. I have seen the plans and they show missing houses and buildings so I know at least part of this is true. You can also find this on the Village website. So not only is this going to cost you over 9 million more it is going to destory some peoples lives! I do know how to stop this $9 million plus debt and the travesty of taking peoples homes away. Dissolve Amelia now!